These aren’t your grandpa’s dentures. We’ve come a long way in the dental industry and are proud to offer modern affordable dentures that can comfortably and beautifully replace your teeth. 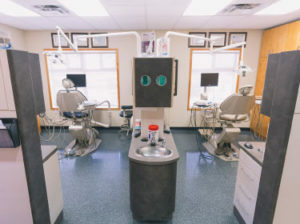 If you are interested in dentures and live in or near Grande Prairie, our team at Higson Dental Group will be happy to explore the denture and implant options available to you. We understand the physical and emotional challenges that can come with losing your teeth. Our Grand Prairie dentists offer comfortable, life-like restorations for the replacement of missing teeth. Let us design a denture that will fit securely and effectively while restoring function and beauty to your smile. We offer several options for dentures and partials including removable and implant supported prosthetics. Losing your natural teeth can be emotional and distressing. But with new dental technologies, you can have high-quality dentures that fit comfortably and look good. There are two kinds of fabricated dentures. Partial dentures are best for people who still have some of their own teeth. They use a cast framework and molded teeth that attach to natural teeth for support. Dental implants are sometimes used to anchor partial dentures. A denture secured with dental implants helps considerably in preventing bone loss. Complete dentures replace a full row of top or bottom teeth. Upper dentures include gum-coloured acrylic and cover the roof of the mouth and bottom dentures curve in the shape of a horseshoe, to give space for the tongue so you can properly eat and talk. Denture teeth are made of either plastic or porcelain. Regular visits with your dentist will help make for a longer-lasting product. We can make sure they continue to fit comfortably and stay in good condition. However, just like regular teeth, dentures will have natural wear and your dentist will recommend when it’s time to replace or reline them. Homecare is also important in the longevity of your dentures. Find out from the experts at Higson Dental Group how to best maintain and clean your dentures on your own. We can also help you in the denture selection process. Dentures are custom designed to your mouth for optimal comfort and function. We help patients create a denture that not only looks like natural teeth, but fits comfortably and securely so they may speak and eat with confidence. If patients choose to receive dental implant secured dentures, our Grande Prairie dental team will help coordinate the phases of treatment. Consult with one of our dentists today at 780-532-4661.